Dog food has changed radically over the last decade. In years gone by, we fed our dogs on scraps from the table and that seemed fine. These days, feeding our dogs has become a science of discovery. Initially, a few brands of kibble came onto the market and soon became a convenient and cost effective way to feed our dogs. As manufacturers realized the opportunity in the pet food market, a plethora of brands sprung onto the shelves of pet stores, giving us choice as to what we fed our dogs. In the early days, the majority of the bagged kibble was grain based and that was acceptable at the time. We are often asked the question of whether a dog needs grains or, indeed, if grains have health benefits for dogs. To explain, dogs are omnivores, which mean they can eat meat, fruit and vegetables, all things sourced in the wild. Ingredients like maize, soy, barley and wheat create bulk to dog food and are inexpensive. However, a dog’s digestion is not equipped to break down and metabolize complex carbohydrates and cereal grains. Whilst many dogs appear to do okay with a diet containing grain, most will thrive on nutrition with higher meat content. 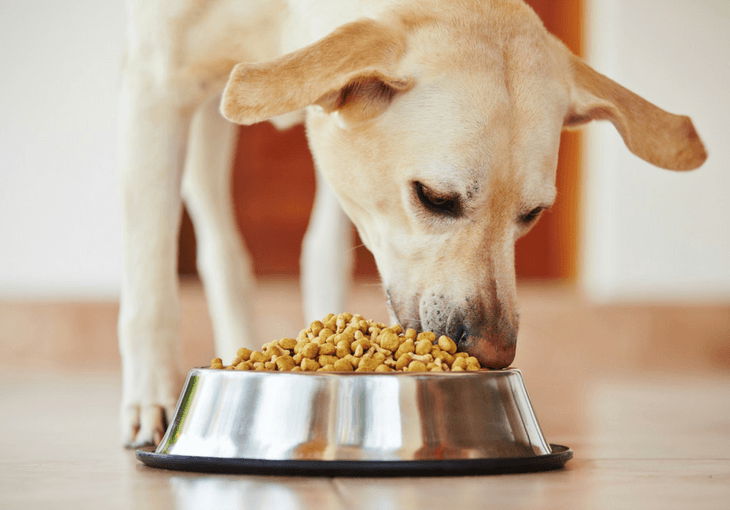 Veterinarians and food manufacturers are discovering that grain free dog food can be problematic for some dogs, causing food allergies and other health problems, which we will discuss later in this article. ​​​​Grain free dog food contains NO grains. With no grains added, dog food manufacturers replace the bulking ingredients with a higher content of meat, fruit, potatoes or other vegetables. What grains are in dog food? A grain free diet does not necessarily mean it is carb free. It depends on what ingredients have replaced the standard grains. Some manufacturers replace with healthy carbohydrates like sweet potato or ordinary potatoes, which are carbs. Meats are protein, needed in a healthy diet for dogs. Is grain free pet food more natural? Dogs, though not strictly carnivores, will scavenge any food but it is more natural for them to eat meat, vegetables and fruit, which they could scavenge in the wild. Thus, a grain free dog food is more natural than one that contains grains. What is gluten free dog food? To answer this question, let us explain that gluten is a protein found in certain grains, notably barley, wheat and rye. Gluten free dog food would contain no grains whatsoever to fit the description of gluten free. Is gluten free dog food a fad? Gluten free dog food has certainly become popular over the last few years, but for good reason. Dogs do not digest grains particularly well, so a diet that contains gluten can cause a range of health issues from allergies to digestive problems. Are there any benefits of going gluten free? With any mammal, good digestion is the key to optimum health. If your dog has a compromised digestive system, this can create all sorts of health problems. A gluten free diet ensures that the food has no grains in it. Of course, you still need to check what ingredients are in the food of your choice. Most common are root vegetables, which digest easily, and a range of fruit and vegetables. Normally, a grain free dog food will contain more meat content than a food that has grains in it. Ideally, they are the same. As gluten is a protein found in grains, then a gluten free diet should contain no grains and a grain free diet should contain no gluten. How to know if your dog needs grain free or gluten free dog food? If your dog is presenting any health issues like allergies, upset tummy, skin conditions, itching or ear infections, the first thing to check are the ingredients in his current food. Your veterinarian can do an allergy test to identify the causes of your dog’s allergic reactions. The ingredients on the dog food bag list the largest percentage of ingredient first, down to the smallest percentage of ingredient. If maize is the first ingredient listed on the bag, know that this kibble contains more maize than any other ingredient. For a dog with health issues, this could be a concern. Our advice is to look for a grain free dog food that has meat listed as the first ingredient and with the highest percentage of all of the ingredients in the food. Does my dog need grain free? An ideal dog food is grain free or limited grain. Some dogs appear to have no issues with a diet containing grain, but look at their stool on a daily basis. A diet higher in meat will produce a smaller stool and with less smell. Dogs fed on a diet containing grains can experience loose stools, flatulence or diarrhea. Does my dog need gluten free? The answer to this is the same as if your dog needs grain free. The health benefits of having a gluten free diet are as great as a diet with no grain. What about dog food allergies? As we mentioned earlier, if your dog’s digestion is not functioning 100% there may be some health issues. Some dog breeds seem to be predisposed to higher risks of food allergies. This is typically prevalent in pedigree dogs, but does not rule out cross breed dogs. One of our writing staff is an ex dog groomer with seven years’ experience. She reported that out of the hundreds of dogs she groomed, the dog that had the worst skin conditions, stemming from food allergies, was the West Highland white terrier. 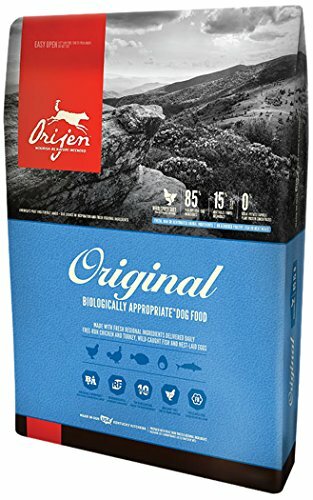 Is grain free to way to go for my dog? We may be biased in our opinions, but we would answer that yes, grain free is the best diet for your dog. Most food allergies start from around the age of five months, so starting your puppy on a puppy grain free diet can positively influence his long-term health and well-being. Where did grain free dog food come from? By nature, dogs are scavengers. With their highly developed sense of smell, they can sniff out food easily. A dog will eat pretty much anything edible like corn, grains, vegetables, fruit and, of course, meat. When dogs first became associated with man, they were fed on whatever was available, mostly food scraps and leftovers. From around WW2, the first sealed bags of kibble became available, mass-produced for the pet food market. As the public got used to the convenience of bagged dog food, new manufacturers rushed to produce the next best-selling kibble. Today, as you search for a new food for your dog, you face the dilemma of choosing from a HUGE selection of kibble, all promising that they are the best for your dog. As we have mentioned earlier in the article, the greatest benefit is improved digestion, which can influence the immune system, skin condition and general health. Effective digestion is at the heart of good health. That said, not all allergies are food related. Some dogs have allergies to other things like air pollutants. However, diet is always a good place to start when you are trying to identify the cause of health issues. Consultation with your veterinarian can identify the cause of allergies. As with any change in your dog’s diet, do not switch to the new food immediately. Keep feeding his original food, but replace with half a handful of the new food for a day or two. Then gradually add more of the new food and less of the old food. The reason for this is that your dog could get an upset tummy as his digestion is not used to the new food. This change over process should only take about a week. During this period, observe your dog closely. Watch out for any tummy issues, changes in behaviour or vomiting. If you are at all worried, stop feeding the new food and check with your veterinarian for advice. Gluten free or grain free does not equal a low carb diet. Always check the packaging to see what the ingredients are. Manufacturers will often use sweet potato, potatoes, tapioca, rice or green peas, all of which are moderate to high carbohydrate content. Should puppies eat grain free food? Start your puppy as you mean to go on. Your new puppy may have an upset tummy for a few days when he first arrives at your home. This may be partly down to the stress of his new environment. He does not know you and may be missing his siblings. If you have bought him from a good breeder, they will have given you a week or more of his usual food. Ask the breeder what the food is so that you can do your research on it. You must purchase a dog food specifically for puppies – at this stage of life, a puppy has different needs to an adult dog. If you are choosing gluten free or grain free food, make certain that you buy puppy specific. Most manufacturers have this option. Then decide if you want to put him on a gluten free or grain free dog food. Potentially, this may reduce potential health issues once he has settled at home with you. Allergies usually begin at around five months old, so generally within the first two months of you bringing him home. Source good quality gluten free or grain free dog food and look for one with meat at the main ingredient. We would always advise discussing this with your veterinarian before you consider changing your dog’s diet to grain free. Although we have explained the benefits and it may be something that you feel strongly about, it is wise to have your dog checked first to confirm that there are no underlying issues. If your dog already has issues and you aren’t sure about the food you are currently feeding him, you can get an allergy test done with the vet who can tell you what the likely causes are for the allergies. Doesn’t my dog need fiber? A diet that is low in fiber can create loose stools. A good quality grain free dog food will have sufficient fiber for your dog. If in doubt, consult with your veterinarian. We understand it can be challenging to decide upon a grain free dog food for your dog. With so many great choices, we have selected the top seven that we rated as among the best. 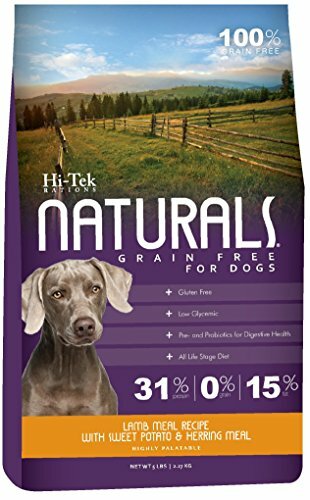 Rich in antioxidants, minerals and vitamins, Hi-Tek Naturals is a premium dog food that contains no grains or grain products. The sweet potato and lamb meal formula contains prebiotics and probiotics for gut health and batch meets all AAFCO standards. 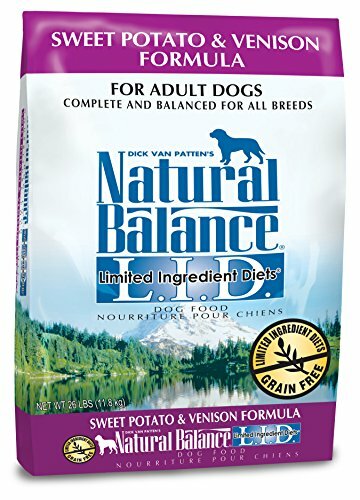 Sweet potato and venison Natural Balance is a grain free dog food containing no artificial flavors, colors or preservatives. The sweet potato provides a good source of carbohydrates and potassium and the venison is a premium source of protein. Natural Balance do nine safety tests on every batch of food produced, which gives you reassurance that you are feeding a quality food. Made with real roasted meat (listed as bison and venison) Taste of the Wild is a highly digestible, grain-free formula with sweet potatoes and peas. It is suitable for active dogs. Taste of the Wild contains vegetables and fruits, which provide a rich source of antioxidants. 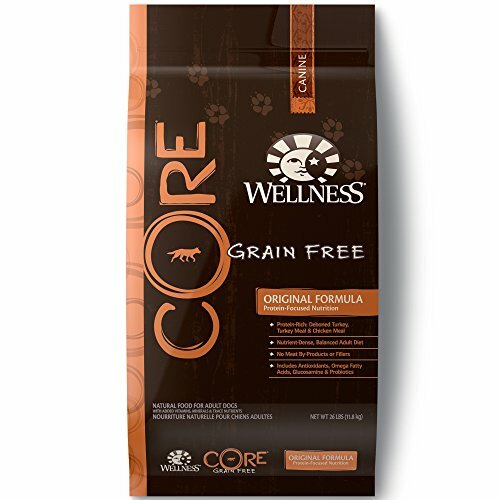 A premium grain free dog food by Wellness Core supports the raw feeding philosophy by providing a food that is rich in meat. Wellness Core states that the grain free dog food contains 80% more meat than dog foods that contain grain. Wellness Core is rich in turkey and chicken with real vegetables but does not contain wheat or corn, soy, meat by-products, artificial colors of favouring and has no preservatives. The food is sustainably farmed which ensures freshness of ingredients and (amazingly) it is rated for human consumption. 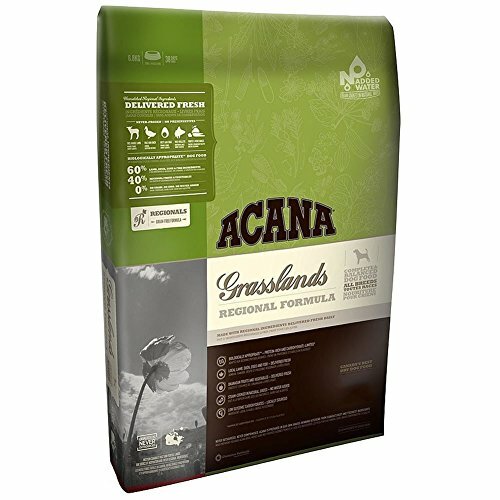 Local lamb, cage free duck and whole grade A eggs make up the Acana Grasslands Regional Formula Grain Free dog food. Acana contains wild caught fish, fruits and vegetables (including sea vegetables for Omega 3). Sourced from Canada, it is high in protein and low in carbohydrates. The food contains 60% lamb, duck, fish, eggs and 40% fruit, and vegetables. 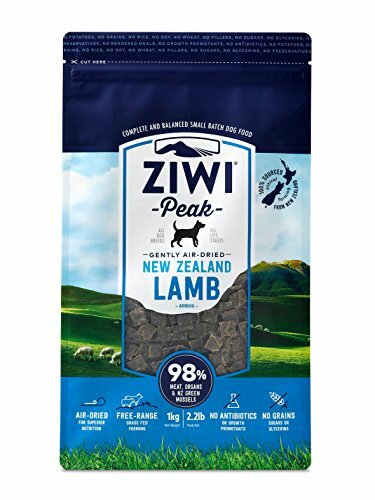 100% lamb is the promise that Ziwi Peak Air-dried Dog Cuisine make about their grain free dog food, which also contain green mussels (a source of Chondroitin and Glucosamine for joint support). Lambs are grass fed on sustainable New Zealand farms and are free of antibiotics and growth hormones. Ziwi Peak has a unique air-drying method to preserve the lamb, which naturally preserves the meat whilst eliminating bacteria. There are no added fillers, grains, corns, soy, wheat or potatoes, rice, sugars and no rendered meats or preservatives. Choosing to feed your dog on a grain free dog food must of course be a personal choice. We realize that making this choice may be confusing if you are not sure what the benefits are of feeding your dog this way. We hope that this article has helped you to make an informed decision, and that your dog will continue to live a happy, healthy life and bring much joy to you and your family.